It was quite a busy week on Radio #EDUtalk on Tuesday David hosted Peter Doran, Chair of the Doran Review, who talked about ‘Strategic Review of Learning Provision for Children and Young People with Complex Additional Support Needs’ (Which can be listed to at: Radio #EDUtalk 6-3-12: Peter Doran). On Wednesday we hosted our most ambitious, in terms or stretching the technology, show so far: A panel discussion on ‘The professional culture of teaching’, with Professor Gordon Kirk, Academic Secretary of UCET, Rosa Murray of the General Teaching Council for Scotland (GTCS), David Cameron (independent education consultant), and Joan MacKay of Education Scotland. 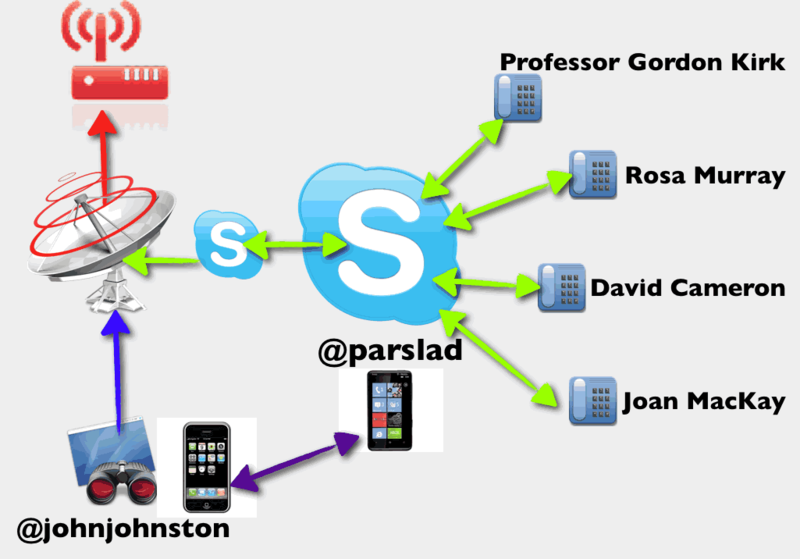 (Which can be listed to at:Radio #EDUtalk 8-3-12: Panel discussion on ‘the professional culture of teaching’). Later in the evening we broadcast a Trailer for Radio #EDUtalk show on 14-3-12: Professor Ian Menter. The Panel discussion was a wee bit more complex than usual as I was working, David was at work and the 4 panellists were scattered across Scotland. Interestingly, to me, was the fact that I was in a location where skype is blocked. So Nicecast was set up on a computer where Skype was not blocked and I connected to this one via Apple Remote Desktop. David pulled the participants into a Skype conference via their landlines, and dialled the remote mac, I picked up the call on Skype via the remote desktop. We used our mobiles to let me know when to start Nicecast broadcasting and for any trouble shooting. David also called me at the end of the conference so that I could stop the broadcast and Radio EDUtalk went back to its Auto DJ. I was busy working with some Trainees and could not listen in. We are having a lot off fun working with this. Internet Radio has been around for a lot longer than most of the Web 2 tools usually used by Educators an offers a lot of potential. It is inexpensive, skype is free, as this discussion was joined by land lines it cost David 5.6p per minute, whole show cost £2.80. Internet Radio Servers are inexpensive and the posterous site is free. On a mac at least the necessary software, NiceCast is easy to set up. Most of the time Radio EDUtalk is broadcasting random bits of audio from the EDUtalk archive. This is now up to 675MB, well over 200 audio files. We broadcast live regularly on a Wednesday evening but would be delighted if anyone wanted to broadcast at another time. If you are interested in running an educational Internet Radio show of any kind please get in touch. We would be happy to run this via Skype with you or give you the opportunity to run the whole thing your self.